Click on the picture for more information about the book. Here's the front cover of Nicholas Wilson's photo book released in December 2006. It's a social history of people, places and events of the Mendocino Coast during the 1970s and early '80s. NEW! The book is newly available as a downloadable PDF format e-book, and the printed book can now be ordered through Amazon.com. The book became a Mendocino Coast bestseller after the limited first edition of 200 sold out in just a week. The 1st Revised edition has gone through over a dozen additional small printings. Books are in stock at Gallery Bookshop in Mendocino, and Mendocino Book Company in Ukiah, California. A paperback version is available for a bit less than the hard cover, but only by direct order from Blurb.com A deluxe Image Wrap binding is also available by direct order from Blurb.com for a bit more than the standard hard cover. Nicholas Wilson is an award-winning Mendocino photographer with nearly four decades of experience and hundreds of happy customers. He brings an artist's eye to documentary style wedding photography that captures the highlights and the emotions of the day in a story-telling photo essay. 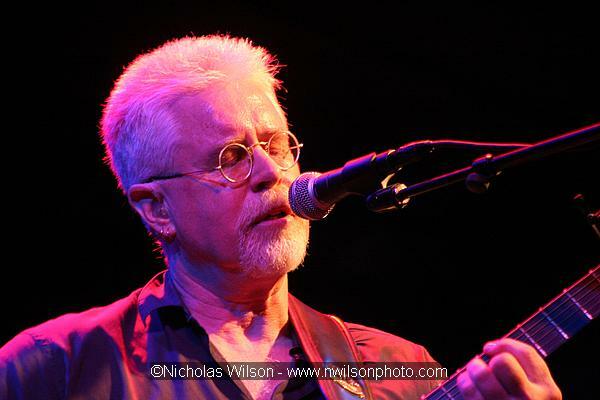 Canadian singer-songwriter Bruce Cockburn headlined the Kate Wolf Memorial Music Festival 2006. Nicholas Wilson has excelled at documentary photography of music, performance and special events since the early 1970s, starting with the Mendocino Coast's legendary outdoor boogies (rock 'n roll dance/picnics) organized by the late, lamented Cat Mother And The All-Night Newsboys, who fled the Big Apple and started a vibrant live music scene on the Mendocino Coast that still echoes today. Nicholas Wilson has been making scenic photographs on the beautiful Mendocino Coast since the early 1970s. His fine prints were exhibited for many years at Zacha's Bay Window Gallery and Highlight Gallery in Mendocino. He was the only photographer represented by Zacha's, the first art gallery in Mendocino, which presented annual one-man shows of his work. Hundreds of his scenic landscape and marine view prints are in private collections nationwide. Many have been published in national magazines and newspapers, including the The New York Times, The Christian Science Monitor, and Oceans magazine. Since 2011 his work has been exhibited at the Mendocino Coast Photographer Gallery in Fort Bragg, California. 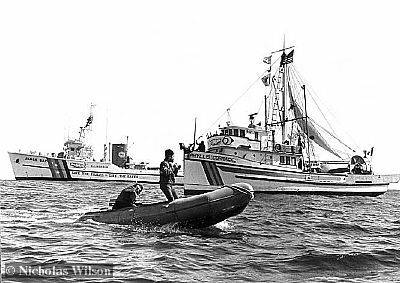 during the anti-whaling campaign of 1976. This photo went out internationally over the UPI wire service. Photojournalism and documentary photography have been important activities of Nicholas Wilson over the past three decades. His news and documentary photos have been published in national magazines and newspapers including The New York Times and Germany's Stern magazine. 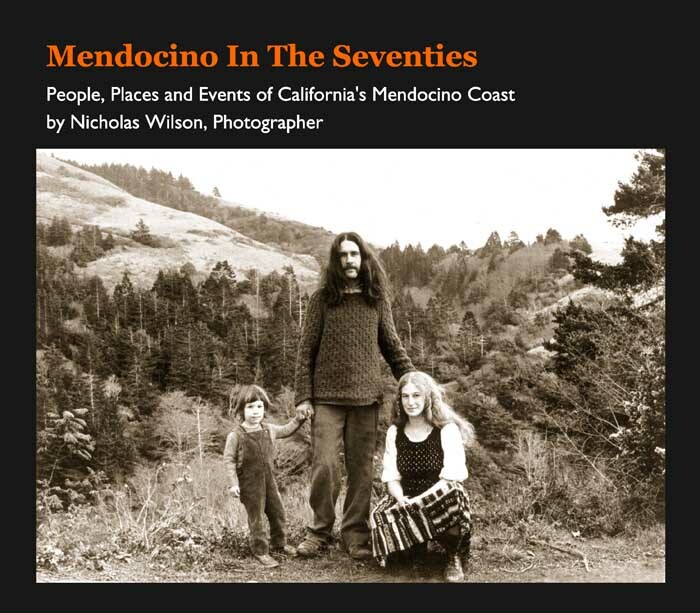 Nicholas has published a new book of his documentary photos of Mendocino in the Seventies. 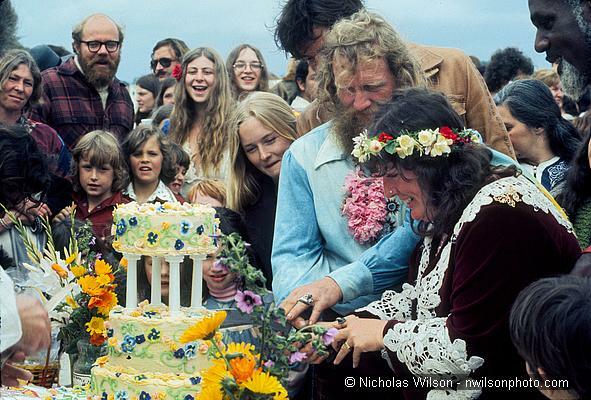 In 1976 Nicholas was the official photographer for the Mendocino Whale War, a colorful local community effort to stop whaling fleets from Japan and the Soviet Union from slaughtering whales off the Mendocino Coast. The two links below take you to the story of the Mendocino Whale War and the online photo gallery. 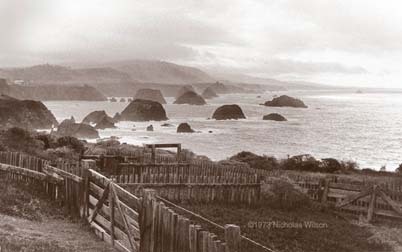 Archival Framing prints of most photos in Mendocino In The Seventies or the web photo galleries may be special ordered. Available print sizes include 8x10, 11x14 and 16x20. Email mail@nwilsonphoto.com for prices and availability. Please identify images by book page or web image file number. View the poster for the Dec. 9, 2006 book release and gallery opening events. If you have comments, requests or suggestions, please write or email. To search this website, enter in the search box one or more words that must appear on the page you're looking for and then click on the Search button. For exact phrases or names place the search phrase in quotation marks, e.g. "whale war" or "Nina Gerber". Thanks for your visit. Please bookmark this page and come again. We get visitors from all over the world!